Why is the Prime Minister giving a plug to evangelical Christian groups seeking to proselytise in the workplace? 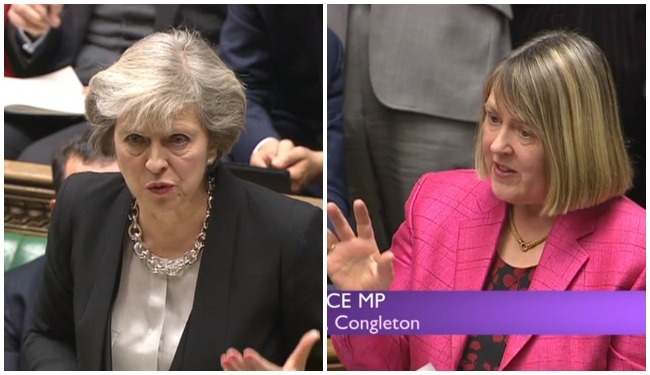 A weird exchange at today’s PMQs raises the question. “My honourable friend raises an important issue, which matters to both her and me. And I think that the phrase that was used by the Lawyers’ Christian Fellowship was, ‘the jealously guarded principle’ of that ability to speak freely, as she says, respectfully and responsibly about one’s religion. I’m happy to welcome the publication of this report and its findings. Of course we’re now into the season of Advent, and we have a very strong tradition in this country of religious tolerance and freedom of speech, and our Christian heritage is something we can all be proud of. The report in question, Speak Up, is not a report so much as a set of guidelines for evangelicals looking to spread the good news without falling foul of the law. It was produced jointly by the Lawyers’ Christian Fellowship (LCF) and the Evangelical Alliance, two Christian lobby groups which are explicit about their mission to proselytise. As the bio page of Speak Up says, the LCF seeks to ‘encourage and equip’ its over 2,000 members, who are lawyers and law students, ‘to speak about Jesus Christ and live out the good news of the gospel within the legal profession’. The Evangelical Alliance seeks to ensure Christians ‘listen to and are heard by government, media and society’, and its work includes ‘lobbying the government for a better society’. It’s website says ‘we believe … The divine inspiration and supreme authority of the Old and New Testament Scriptures, which are the written Word of God’. The report itself has to be read in this context. It offers Christians guidelines (which it makes clear are not legal advice) on how to talk about their religion so more people follow it or adopt its ideas. The report has sections on ‘sharing the gospel at work’, ‘sharing the gospel in public’, and ‘sharing the gospel on social media’. It includes advice on where you can talk about people’s ‘sexual orientation’ and how far you can go. The report doesn’t appear to call for any rule-bending, and does seem like a good faith (excuse the pun) attempt to inform people about their rights and the law. But it does so in order that they know how best to ‘share the gospel’ as part of a clear political agenda. How political? A Dispatches investigation in 2008, In the Name of God, found Andrea Williams, then LCF public policy director, called the Human Fertilisation and Embryology Bill the work of the devil, supported banning abortion, considered homosexuality sinful and was a young earth creationist. Williams no-longer works for the LCF. But both groups are committed to seeing their views shape public policy, with the help of friendly MPs like Fiona Bruce. How nice for the Prime Minister to give them a boost under the banner of the non-existent ‘Christmas wars’! With less than 59 per cent of Brits identifying as Christian (most of them Anglican), and at least a quarter ticking ‘no religion’ on the census form, this is a strange move for a PM who wants a society that ‘works for everyone’. If this was a report in respect of any other religion I wonder if Adam would have been so cross? As a Muslim what I find with Christians is that more people are self identifying as such when faced with ” political ” Islam. I have found this with younger Jews as well. Their religion is a shield against the perceived threat of an expansionist and agressive Islam and I fuly understand that. Why doen’t the writer of this article do the same? I don’t really see the issue here. Surely it’s not surprising that Christians would want to evanglise, as that’s what the Bible tells them to do. But what is the problem with them doing so and ‘trying to convert you’? You’re an intelligent human being who can critically think about what a Christian tells you about the Bible. Discussing rather than shutting down opposing views is kind of important in this age where the left is seen as very self-righteous and judging towards anyone who doesn’t agree with them. It’s ludicrous to suggest that Christians have a political agenda any less than hard atheists do. White British nationals -uncool, never mentions them. London -cool, diverse, hip, happening, tolerant, modern, forward thinking; writes articles almost entirely centered on the demographics of London. Anybody without money (except white people outside London) -exploited, deserving, unable to help themselves or direct their own lives, need to be told what’s good for them. I don’t see why it’s a problem to say what you think about what you believe, or to want to stay within the law. If people disagree with you, no-one’s forcing them to listen. No-one would stop a Muslim or a Jew or an atheist from explaining their beliefs at work, so why can’t Christians. I’m not really sure why this is newsworthy. Of course Christians will want to speak about their faith wherever they are. They believe that they can have a person relationship with God with knowing Jesus Christ and that this gives them eternal life. If that is what they believe, then unless they really hate people, they are going to want to share they have learnt themselves with other people.